A Day in the Life of Bev. Her Story, Part 13! It has been quite eventful since we last wrote. Now in December, Bev has been busy preparing for the holidays and entertaining guests in their home. Additionally, looking back since the spring, the family traveled for Spring Break to Anna Marie Island in Florida. All four drove down from Indiana and took two caregivers with them to assist with care for both Bev and Katie. They loved the time in the warm weather and the sand and a break from the Indiana cold! Another travel, Bev also attended a girls’ trip in May to Arizona, visiting Sedona and Scottsdale. She traveled with her caregiver Pam and they were able to safely maneuver thru the airports. Bev uses a wheelchair to get thru more chaotic situations and is grateful to be traveling and to have the help to do so! Another big trip was on the agenda. 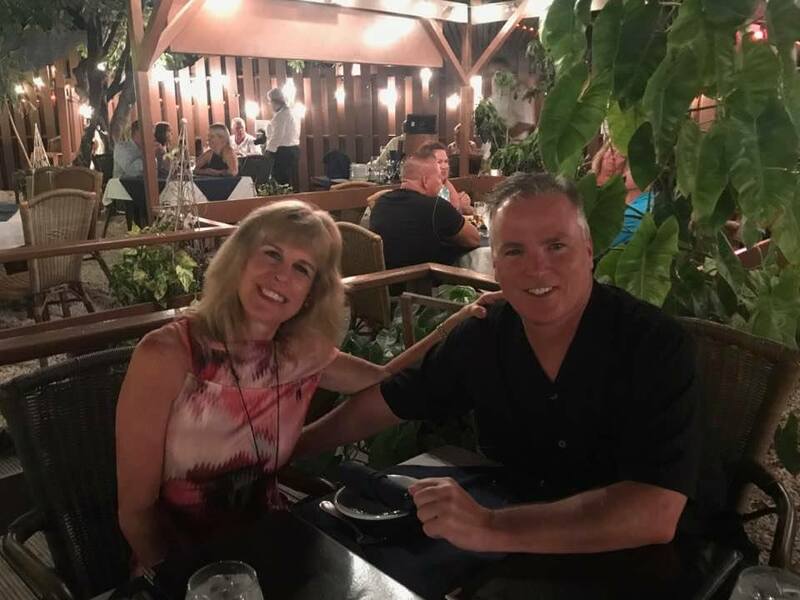 Bob and Bev celebrated 20 years of marriage by going to Aruba in October and enjoyed the trip and down-time together. What a blessing to celebrate 20 years of marriage! Celebrating 20 years of marriage in Aruba in October 2017! Bev’s Huntington’s Disease is still progressing even though she is fighting a great fight. Her medications are keeping up with her symptoms, but her movements are more pronounced. Called chorea, she moves a lot when standing or sitting and her movements can be fast and jerky. This impacts her balance and her walking, but she hasn’t taken many falls lately. This is always a very big concern in the winter time, too. In addition to more movements, she is also choking a lot more, even on water. Choking is a common impact of the degenerative disease due to the change in the muscles all thru the body. Foods have to be strategic and specially cut to help her chew and avoid potential choking hazards. Since choking is more frequent, she tends to be eating less and in that, she’s losing weight and doesn’t have weight to lose. Bev’s day-to-day systems have changed as well. She is challenged with fine motor skills like opening Ziploc bags, meal prep, cooking, writing, and wrapping presents. She uses talk-to-text when writing on the iPhone, but it’s often disjointed and hard to understand….all relative to what Siri picks up! She has trouble with complex tasks and multitasking is extremely difficult. Higher order thinking and reading are all being impacted, but Bev is still very optimistic. To offset the challenge with the disease’s progression, she has found the Kroger “Click List” very beneficial when preparing her weekly grocery list. It’s nice these services are available to make grocery shopping more feasible. 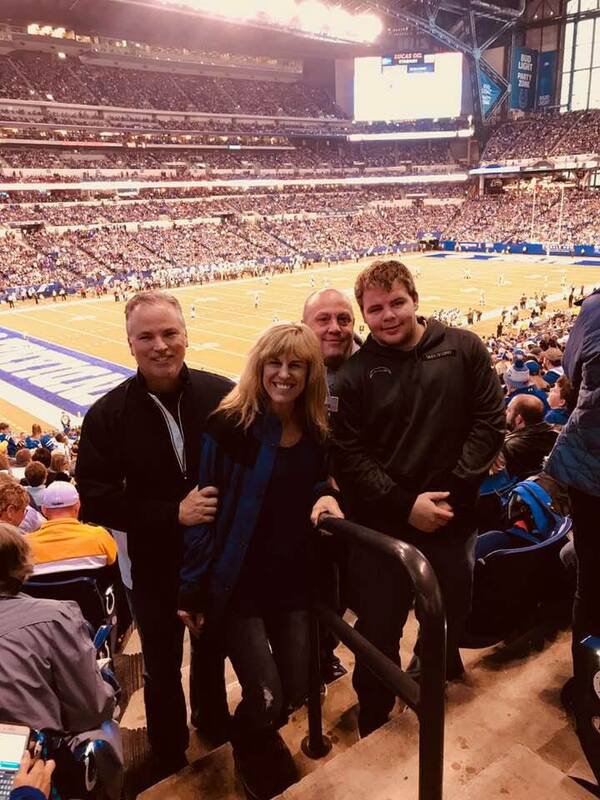 Attending a Colts game in the fall with Bob, her brother, and nephew. Bev is still doing tennis one time per week and has also started a Pilates private lesson with an instructor and a friend. 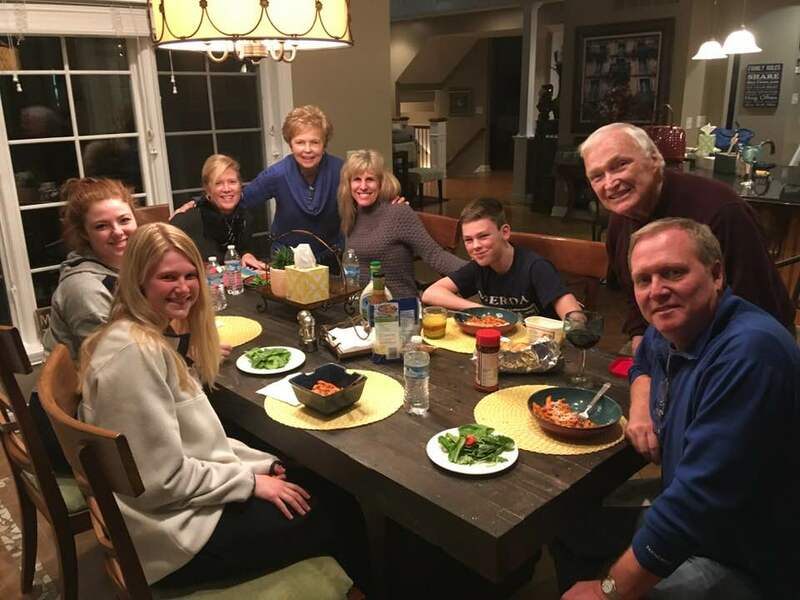 She has caregivers that come into the home in the morning and evening and is also very thankful for three drivers that help her thru the week to drive her to errands, appointments, or just to grab lunch and shop. Long live the shopping! As we prepare for the Christmas season, the home is decorated and the tree is up. Presents wait to be wrapped and more shopping is underway. Even with the progression of HD, Bev is smiling, hugging like a bear, and welcoming everyone into her home with a smile and genuine conversation. She’s winning this fight on HD from her spirit, mindset, and life outlook alone! Save the date! Our 9th annual Bev Hartig Huntington’s Disease Fundraiser is coming soon on April 28, 2018. Save the date and please prepare to attend. Our theme this year is “Team” and we need you to be part of this team to fight the great fight of this disease! PS: Please make sure to like and select to “get notifications” from her Facebook page for frequent updates into our research progress and tidbits about the Hartig family throughout the year! This entry was posted in Bev's Story. Bookmark the permalink.